When I think of Marta I think of stamping and gorgeous photos, often with accessories or even whole shoots involving her mani (she and her husband really create some great eye candy!). I also think of calmer creme colors spiced up with accent nails, shiny sparkly bits and lately saran wrap got added to that as well! I learned to do the saran wrap thing at first by polishing a basecolor and when that's dry, apply a second color and dab it off with saran wrap while it's still wet. But Marta showed that you can also just sponge with it, which is even easier! And you can easily sponge with several colors as well. 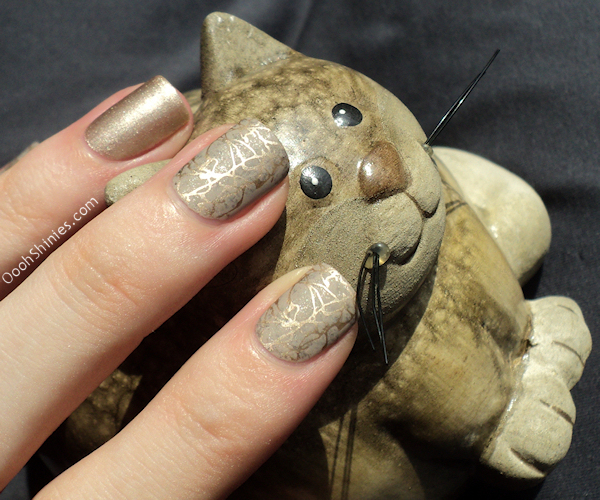 So that's exactly what I did, saran sponging, stamping and an accent nail using shiny polishes. Essence No Doubt saran sponged with Essence Mystic Wish! 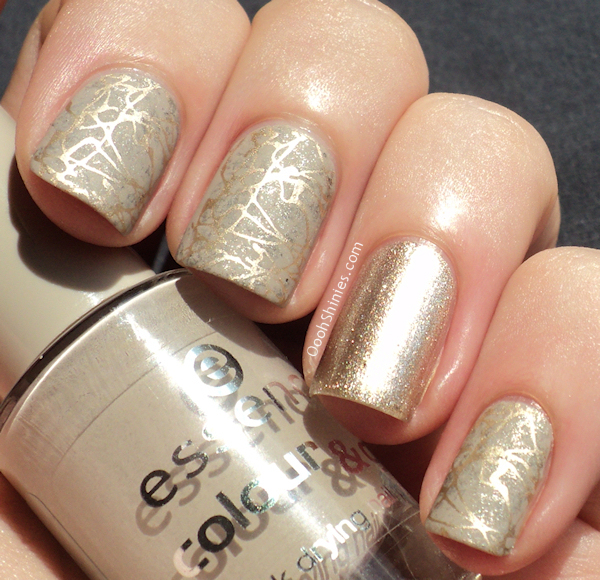 and Essence Metallic Champagne (striper). Stamped with China Glaze 2030 and BPS plate m70. 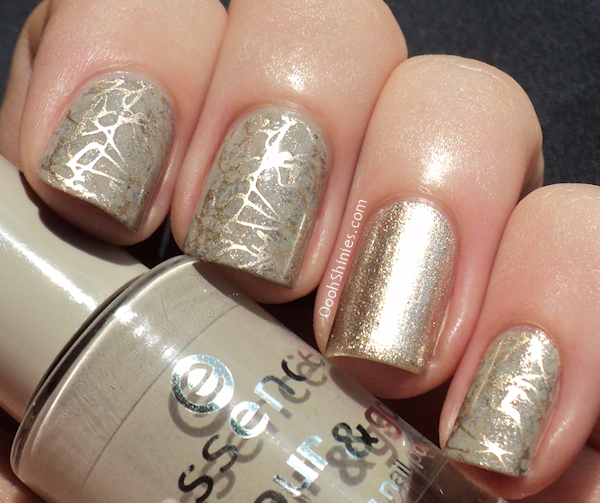 Accentnail with Essence Metallic Champagne (I used an old polish brush to apply it). But I think I'll just stick to bottles =) Left is the shiny version, right the matte. 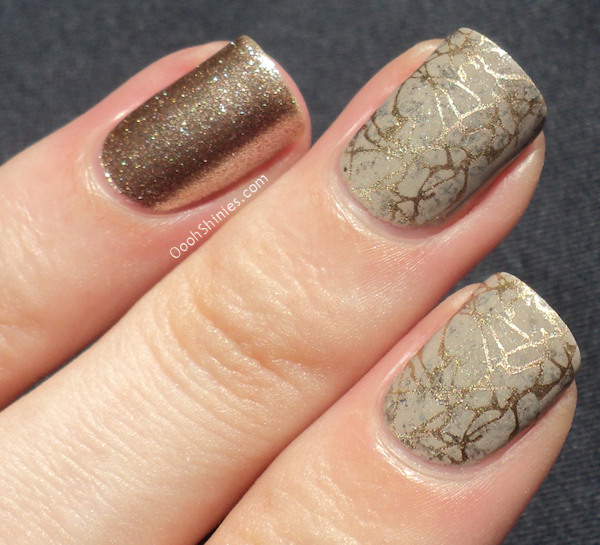 I'd love to hear what you think of this mani! Subtle & matte, just the way I like it! Guest Post: OMG! Polish 'em!